A big, big thank you to everybody who entered the Fairtrade Fortnight Schools Award this year – we had so many fantastic entries and it was amazing to see the effort schools made to celebrate and spread awareness about Fairtrade during our two-week annual campaign. A special shout-out first of all to Chase Grammar School, Staffordshire, who sent their amazing entry in a baking tin. We’ve been showing the fold-out booklet and photos to everyone in the office. Another creative entry was from St Serf’s Primary School who wrote their entry in the form of a poem (featured below). A big special mention goes to The Leys School in Cambridge who organised a conference for 12 local primary schools and gained some great media coverage. If you’re on Twitter, it’s definitely worth following @LeysFairtrade to see their amazing work and ideas. The group are always thinking of ways to engage students with Fairtrade, from haiku competitions to bananagrams. Our runners-up this year were The Hyde School in north-west London and Catcote Academy, Hartlepool. Year 1 at The Hyde School started off their year with the topic of chocolate. They then stumbled upon Fairtrade and what it means and there was no looking back! 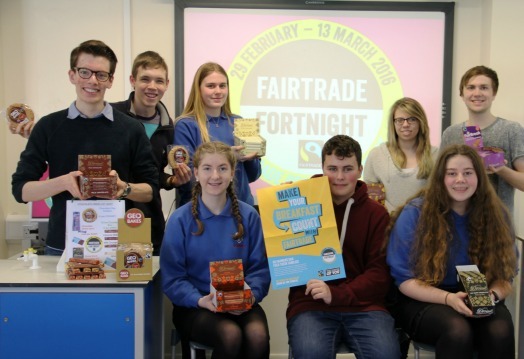 Their entry clearly described the growing indignation that pupils felt about some cocoa farmers not getting paid a fair price for their work and by Fairtrade Fortnight they were driven to action. Pupils wrote to their headteacher and asked if they could have Fairtrade products in school. The headteacher contacted the borough’s catering services manager who came in and listened as the pupils told her what they had learnt and which Fairtrade products they would like. We look forward to seeing how they get on! Meanwhile, Catcote Academy held a three-day event involving their local Fairtrade Town group, local churches and primary schools. The students welcomed special guest Luz Marina García Ruíz from a Fairtrade coffee co-operative in Colombia and greeted her with musical instruments made from Fairtrade coffee beans and painted in the colours of the Colombian flag. St Edmund’s School, Canterbury: St Edmund’s Junior pupils used Fairtrade wrappers to make an incredible papier-mache breakfast display for a Fairtrade fair in their local church. 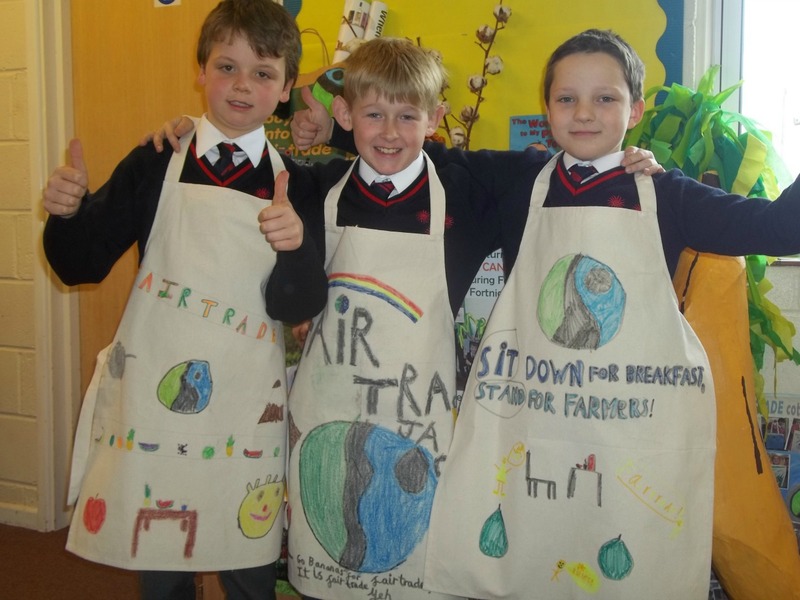 They also ran a Fairtrade café, a Traidcraft stall and decorated aprons with Fairtrade messages to sell to visitors. They even found time to have a real Fairtrade breakfast too! Imberhorne School, East Grinstead: What we loved about Imberhorne’s entry was the fact that all of the events were organised by sixth formers, who worked with every year group. They wrote lesson plans and PowerPoint presentations for the teachers to use with each class and assembly scripts tailored to different year groups. They also visited local primary schools and a local Beaver group, appeared on local radio and ran another very successful Fairtrade Fun Day for the whole school. Winners will be receiving £350 and runners-up will be receiving £100 to spend on Fairtrade activities in their school. A big, big thank you to everyone who entered – we really enjoyed reading your entries! And we knew what we had to do! And stand up for farmers too! But they don’t have enough money to spend. Host our own Big Breakfast event. To the gym hall our ENTIRE SCHOOL went! Our local Morrisons and Tesco were so kind. We had to work hard but we didn’t mind! “Our Breakfast was the best!” we were heard to boast! They were impressed there is no doubt! A ‘foodie’ song from every class. We didn’t want the day to pass! At St Serf’s we care about you! !